As you continue around the coastal road, the silver sea flashes to your left, Puffin Island floats beyond the Penmon lighthouse and the Great Orme frames the horizon. 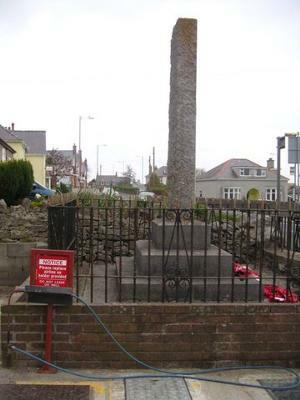 Entering the holiday town of Benllech you might drive right past the memorial unless you need some petrol, for standing surrounded by a garage forecourt is the tall stone monument. The names of the men who fought and died in the First World War are fading into the grey stone and are difficult to read, and like most of the other memorials on Anglesey, the heroes of the Second World War have been added around the base on granite. And councillors huddle bent in shifty deals. To face the enemy, and died alone. And MOTs are given round the back. And given no thought of your dying face? I agree - have tried to photograph this memorial but the 1914-18 names don't stand out against the light grey granite. They need repainting in a dark colour. Its situation in front of the recycling/waste baskets of the store also does nothing for it. Pity, as the names recorded include a lady stewardess drowned in the LUSITANIA sinking 1915 - the village's first casualty - and several navy/ merchant navy men lost by mine or torpedo. The soldiers died on the Somme, at Ypres, and elsewhere in Belgium & France, and two in the Salonika campaign, Greece; another probably fell in South Russia during the 1919 campaign against the Bolsheviks. Others died of their wounds in the UK and are buried more locally. One had emigrated and was killed with the Canadian forces at Vimy Ridge in 1917. They deserve just a little better than faded names.